Escape the ordinary and host your next corporate event, team building exercise, or business meeting at Calabogie Peaks Resort. Leave behind the hustle bustle of the city for a business meeting venue which is very private, very quiet and offers outstanding meeting facilities and service for the ideal corporate getaway. Close to the city but far from distractions your team can focus in a relaxed and beautiful rural environment. Enjoy spacious meeting rooms, exceptional accommodations, and outstanding food services. Compliment your time spent at the conference table with seasonal activities and team building on the Mountain, Lake & Land. Calabogie Peaks is the perfect location to connect, create, and exceed. 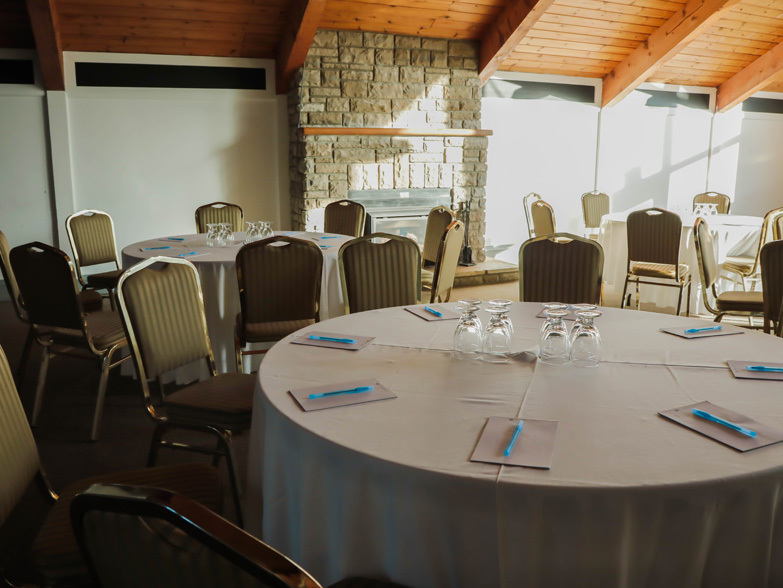 Calabogie Peaks Resort is proud to offer four large rooms for corporate events and meetings and three smaller breakout rooms. We have a cumulative 8,000 square feet of meeting room capacity and wireless high-speed internet throughout the accommodations. Enjoy panoramic views of the mountain and lake from this event space, perfect for smaller groups. Named for the Madawaska River, this room’s warm and relaxing atmosphere is enhanced by a charming fireplace and beautiful natural lightning. Named for the historic graphite mine, Black Donald’s features 25-foot floor-to-ceiling windows with a spectacular view of the mountain. Located on the top floor of the ski lodge, this room also features a terrace for warm weather events and receptions. Two spectacular antler chandeliers set the tone for this mountain side meeting room in the base lodge. This meeting room can be combined with the Annex to hold 220 people. 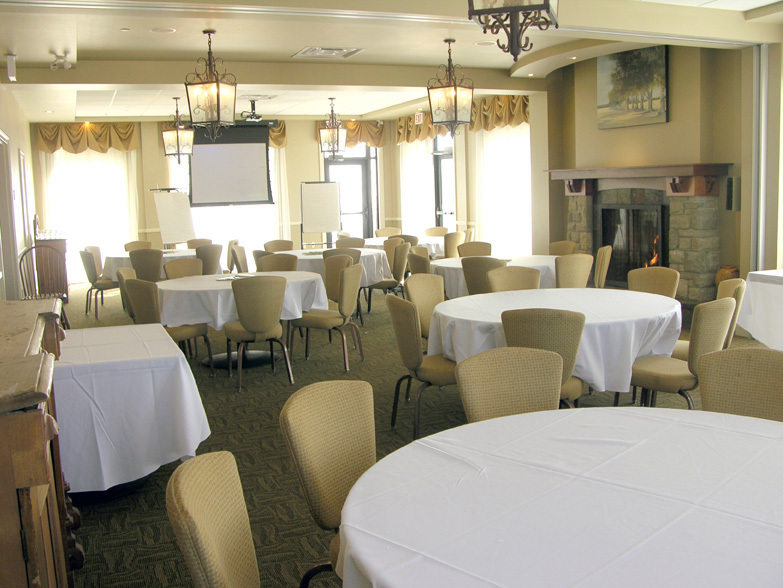 The Annex is the newest corporate event venue available at Calabogie Peaks Resort. Located in the base lodge the room is filled with natural light and offers gorgeous views of the mountain. Combine the Annex with Algonquin Hall to accommodate 220 people. 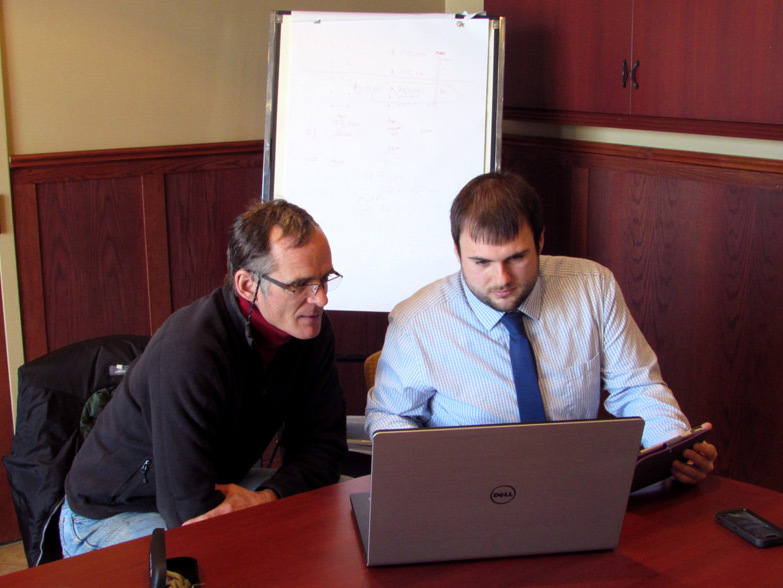 A small meeting room in the Calabogie Peaks Hotel is the perfect place for small groups to meet. 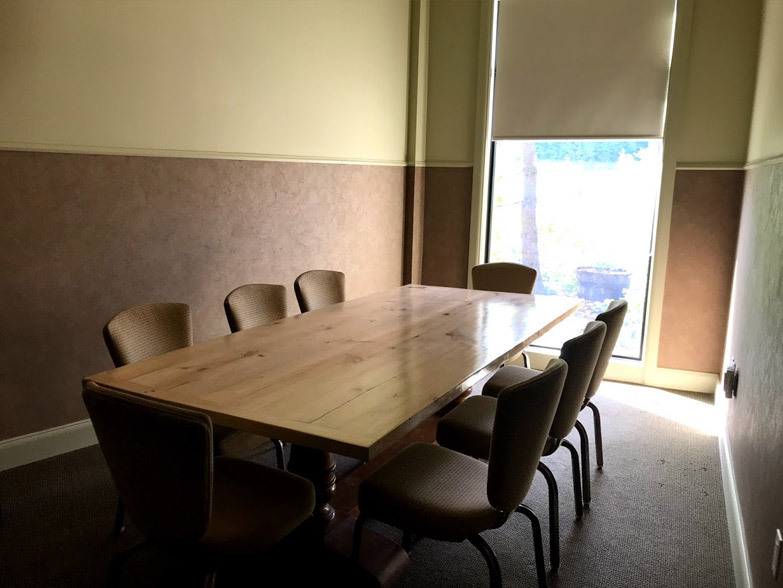 The boardroom table sits up to 10 people in this bright and spacious room. 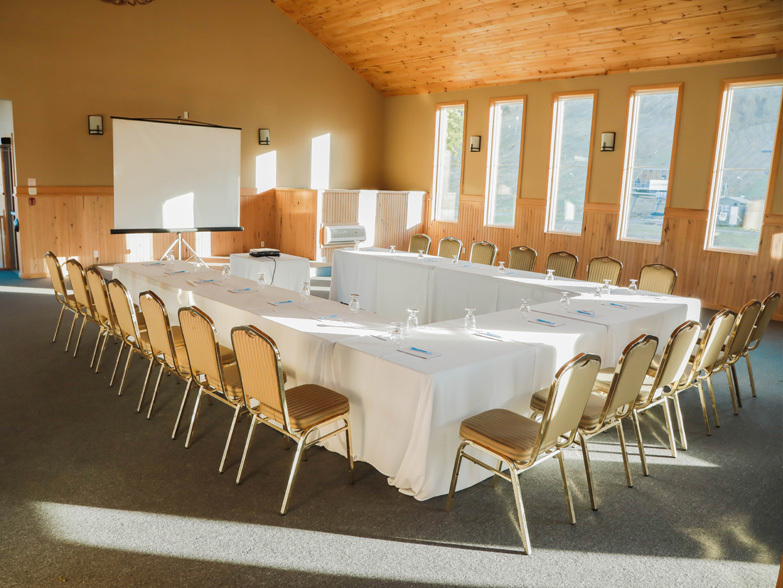 A breakout meeting room in the Calabogie Peaks Hotel with large pine table is situated with a view of the pond and mountain. The table sits eight people comfortably. Combine Algonquin Hall and The Annex for the ultimate corporate event venue space. 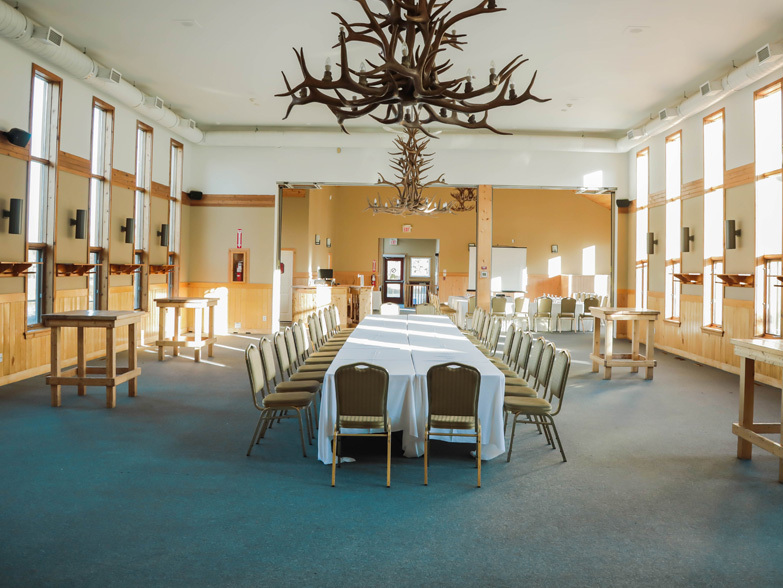 Together, these two venues serve as a grand hall for larger events offering spectacular views, lots of natural light, and signature antler chandeliers for an authentic Calabogie Peaks atmosphere. Fresh produce, locally raised proteins, and savory dishes comprise only part of the catering offerings available at The Peaks. Your discussions with our event coordinators and collaboration with our food services will yield a menu that will keep your team focused and well fed. We’ve got your technical needs covered. Learn more about the audio/visual technology and equipment we provide to ensure your event runs smoothly, and book the professional-grade equipment you need to deliver your message and presentation. Flip Charts – $15 each per day + HST | Power Bars – $10 each per day + HST | Extension Cords above those required for AV equipment – $10 per cord per day | Portable Speakers, Wired Microphone and Sound Mixer Board – $100 per day + HST. Great ideas are born at Calabogie Peaks Resort – Retreats in a balanced, beautiful environment exceed objectives. “Calabogie is unequalled in terms of the value for money they provide, especially the richness of the experience. We’ve already decided we’d like to go to Calabogie Peaks once a year now because our retreat was a ton of fun and such a success.